make / must have my creative medium! Must Have My Creative Medium! We all have art supplies that we feel we cannot create without. For most artists that list changes from time to time depending on the new releases that just keep getting better and better. A product at the top of my list right now is Iridescent Creative Medium paste. Here is one of a series of panels created using that product. Cut panel to measure 6” by 4” from watercolor paper, apply a thin coat of gesso, dry. Stamp image with StazOn Jet Black ink. 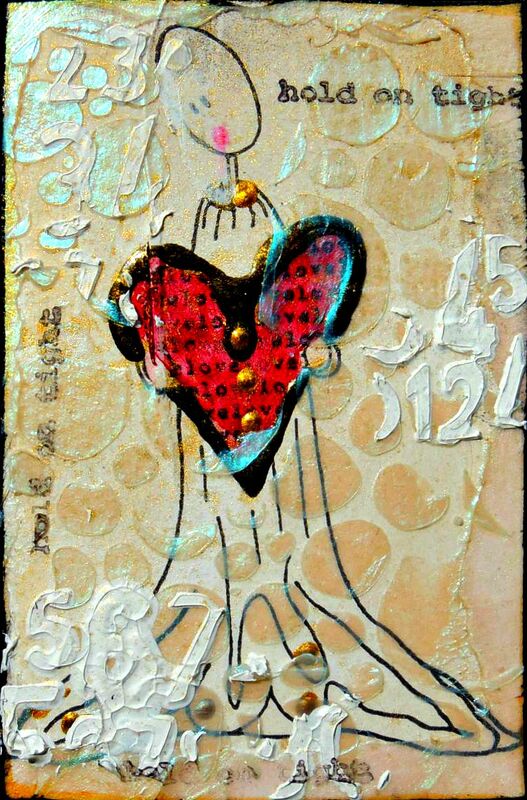 Apply Pink Iridescent Creative Medium around the edges of card. 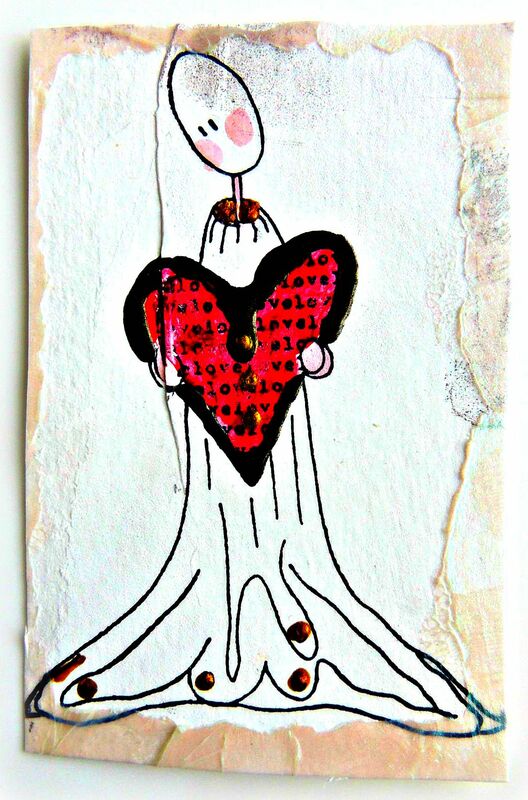 Color the angel and the heart with Memento Markers. 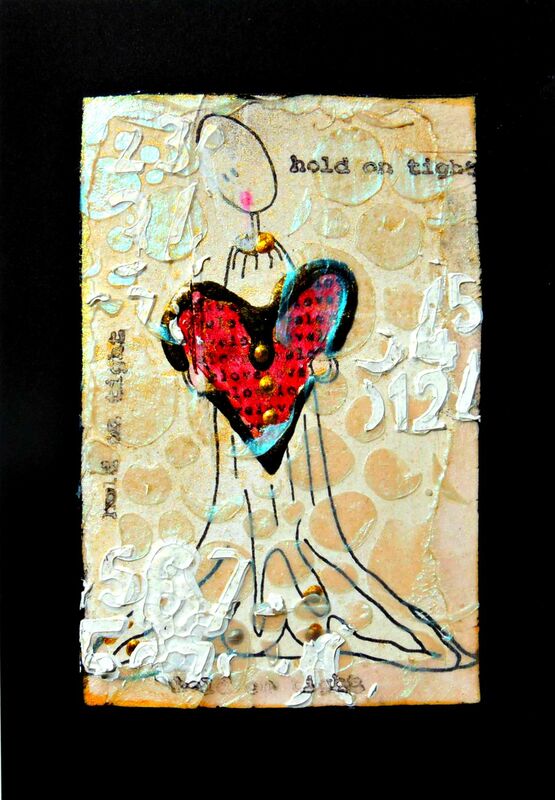 Using an irRESISTible Copper Pico Embellisher, outline and highlight parts on the stamped image. Allow to completely dry. Lay a stencil over the card panel and spread a thin layer of Iridescent Turquoise Creative Medium with a Scotty Palette knife. Allow to dry before applying a layer of white gesso through an alphabet stencil. Stamp the phrase “hold on tight” with StazOn Jet Black ink, heat set with heat gun. Adhere the card to black card stock. This can be used just as is for a tag/card or mount the panel on a blank card.